Appeal in English Lay Down Your Arms! 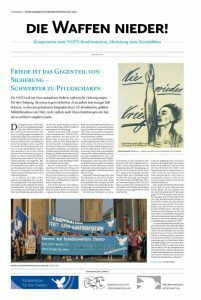 – Die Waffen nieder! Friedensdemonstration 08. Oktober 2016 Berlin. Startseite→Allgemein→Appeal in English Lay Down Your Arms! Thanks World Beyond War for the translation and publicationof the Appeal and the Demonstration. The current wars and military confrontation with Russia compel us to take to the streets. Germany is engaged in war nearly every part of the world. The German government is pursuing a drastic arms buildup. German companies are exporting weapons throughout the world. The business of death is booming. We are resisting this policy. The people in our country do not want wars and an arms build-up – they want peace. Politicians must respect this. We do not accept war increasingly becoming a part of our daily lives, and Germany’s growing contribution: in Afghanistan, Iraq, Libya, Syria, Yemen, Mali. The war in Ukraine has not been ended. It is always about hegemony, markets and raw materials. The USA, NATO members and their allies are always involved – and Germany either directly or indirectly. War is terror, causing millions of deaths, mass destruction and chaos. Millions more are forced to flee. Refugees need our support and protection against racist and nationalist attacks. We defend the human right to asylum. To eliminate the cause of people fleeing, we call on the German government to stop all military interventions in areas of crisis. The German government must contribute to political solutions, promote civilian conflict management, and provide economic aid to rebuild these devastated countries. People around the world need justice. This is why we reject neoliberal free trade zones such as TTIP, CETA, ecological overexploitation, and the destruction of peoples‘ livelihoods. German arms deliveries are exacerbating conflicts. US $4.66 billion are squandered daily for the global arms trade. The German government plans to increase its annual military spending from 35 to 60 billion euros over the next eight years. Rather than upgrading the Bundeswehr for worldwide operations, we demand that our tax money be used for social services. Since 1990, the relationship between Germany and Russia has never been as bad as it is today. NATO has revived its old bogeyman, and is now expanding its political influence and military apparatus by deploying rapid response forces, holding military exercises, and installing the so-called missile defense shield – accompanied by verbal threats and provocations – right up to Russia’s borders. This is in direct violation of pledges made to pave the way to German unification. Russia is responding with political and military countermeasures. This vicious circle must be broken. Finally, the upgrading of US nuclear weapons – called &quot;modernization&quot; – exponentially increases the danger of a military confrontation, even a nuclear war. Security in Europe can only be achieved WITH, not AGAINST Russia. We say no to nuclear weapons, war and military interventions. We demand an end to the militarization of the EU. We want dialogue, global disarmament, civilian conflict management, and a common security system based on mutual interests. This is the peace policy we stand for. 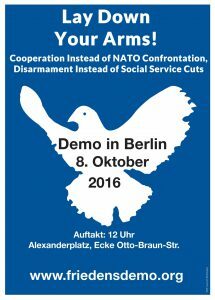 We call for a nationwide demonstration on October 8, 2016 in Berlin.